Surprises can pop up in the most unexpected places. On a recent vacation to the Columbia River gorge area in Oregon, I discovered a most pleasant surprise … a cedar strip boat, kayak and canoe builder. Ray Klebba has been building water craft for over 20 years, and his skill shows in the finished products I saw and photographed. He actually refers to his water craft as “functional art” and I have to agree with him. Many of his pieces grace the luxurious interiors of many of America’s lodges and corporate offices. When I visited Ray in his shop, he was working on a cedar strip canoe for a customer. The outside was pretty well done and Ray was working on the inside. What you cannot see from the pictures is what a beautiful boat this really is. There is something about cedar strip water craft, and the way the hull flows because of that gorgeous Vancouver Island cedar stripping that makes up the hull. For those woodworkers who would like to make their own cedar strip canoe, kayak or boat, you can even purchase any one of these kits from Ray’s “White Salmon Boat Works”. I have personally heard from a number of woodworkers who purchase canoe and kayak kits in the fall and build them over the winter then sell them in the spring for a modest profit. It’s a great way of making a few dollars, creating a beautiful work and keeping busy and woodworking. I’m sure many have family and friends who would love to have a beautiful wooden handcrafted kayak or canoe. If you are thinking of building a cedar strip water craft, I suggest you call Ray. He can provide you with a number of different options and ideas that can make your boat even more unique and beautiful … like adding accent strips. These are a bit more work, but in terms of looks and value they really add to any boat. The cool thing with adding these wooden accent pieces is that with a cedar strip boat or canoe, these accents are visible on the inside of the craft as well because they are not an inlay, but an integral part of the construction. The kits come complete with EVERYTHING you will need, including a detailed manual, in some cases a Power Point presentation of the assembly steps and processes. All you need to add are the tools, some time and your woodworking expertise. One thing I will forewarn you, these kits are not cheap … remember, these are cedar strip, not plywood boats … and huge difference in appearance and construction, but in many ways, easier to work with than plywood panels … and they do come with all the materials needed to put them together and finish them. But wait, there is even more … if you live in the White Salmon area, or want to take a bit of an extended vacation to the area, you can even take a boat building course from Ray and build your own boat, canoe or kayak under the tutelage of a master water craft builder. "My interest in woodworking began during my graduate student years. As an avid music listener and musician, I was inspired to try my hand at making some percussion instruments“ both copies of ˜real' instruments and some that were experimental." I am originally from Shawnee, Kansas. I moved to British Columbia in 1981 after completing my Ph.D. at the University of Illinois to pursue my academic career as a faculty member at Simon Fraser University. I am currently a Professor in the School of Computing Science at SFU which means that my day job involves undergraduate and graduate teaching, research, and administrative tasks. My research is in theoretical computing science, focusing on the interaction between network structure and communication problems. My interest in woodworking began during my graduate student years. As an avid music listener and musician, I was inspired to try my hand at making some percussion instruments â€“ both copies of â€˜real' instruments and some that were experimental. A complication was that I had to do this in the living room of my apartment with very few hand tools. After moving to British Columbia, I continued to explore music and musical instruments and eventually was able to establish a shop in my home. Several years later, I joined a local woodworking club (the Pacific Woodworkers Guild) and began to participate in their annual 2x4 contest. The idea of the contest is to make something using only an 8' long 2x4 (of any variety of wood), glue, and finishing products. The constraints of this contest force the participants to think creatively. My entries have generally been musical instruments. One year, I decided to make a programmable automated xylophone. To complete the instrument, I realized that it would be helpful to have some turned parts. After consulting with my brother (who makes bagpipes), I obtained my first lathe and learned just enough about turning to make the parts. The instrument ("Hunka hunka churnin' wood") was a big hit, winning the contest that year and generating a surprising amount of media coverage. Soon, I did some more turning and eventually began to see myself primarily as a woodturner, rather than a woodworker. I learned more about turning, concentrating on bowls and small functional items. I began to consider the possibility of making more artistic work after seeing an inspiring demonstration by Frank Sudol. An Educational Opportunity Grant from the AAW allowed me to study with Jacques Vesery. That was a pivotal experience, beginning the search for my own voice and continuing to affect my work today. The need for more exposure to woodturners from outside our area was a major motivation for founding the Greater Vancouver Woodturners Guild (an AAW chapter) in 1999. Our club has been highly successful and I have benefited greatly from the exposure to our visiting woodturners. I am currently exploring various surface enhancements on hollow forms and other turned objects. Most of these enhancements involve subdividing the surface into regions. A major focus is my series of puzzling illusion pieces that appear to be jigsaw puzzles. Another series, inspired by the paintings of Mondrian and Klee, has surfaces broken into regions that are individually colored first with alcohol-based dyes and then sprayed with thinned black acrylic ink. The Sherlock Holmes story "The Adventure of the Dancing Men" provided a substitution code that allows me to encode messages on the surface of my '"dancing men" pieces. A series called "burning fields" features surfaces subdivided into irregular and highly textured regions. A recent development is the "vox" - a box that appears to be a hollow vessel when it is closed. I turn on a Stubby 750 using a variety of tools. For hollowing, I am an advocate of the constrained handle systems. I do all of my hollowing with a Jamieson handle and various cutters including those made by Jamieson and by Kelton. I use many different tools for carving including rotary and reciprocating carvers, high-speed dental type tools, and pyrography tools. For coloring, I use acrylics and various dyes. 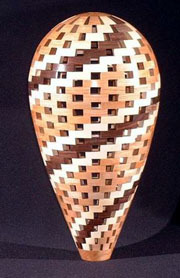 You can see more of my work at www.artliestman.com and at various galleries including del Mano (Los Angeles), Northwest Fine Woodworking (Seattle), Crafthouse (Vancouver), Gallery Xylos (Calgary), the Guild Shop (Toronto), and guild.com (cyberspace). 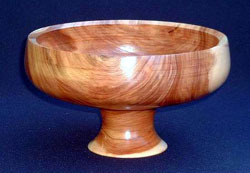 "To some people woodturning is more than a hobby, it becomes an extension of their creativity and artistic endeavors. This month our Feature Member is Colin Delory - Woodturner. We know you will be as amazed as we were when you see the kinds of turnings this dedicated and talented artist creates "
>Colin Delory was born in England then emigrating to Canada as a pre-teen. His formal education took place in Winnipeg, Manitoba a beautiful province with tremendous contrasts in terrain and climate. Colin spent 38 years as a project engineer and engineering manager in the telephone industry in both Manitoba and BC. An exacting career that no doubt helped to formulate his precise accuracy and patience in later years when he took up woodturning. 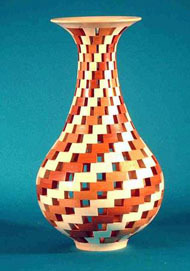 On retiring in 1997, Colin took up woodturning and began turning out some exquisite works. As a lover of wood, he enjoys reclaiming "prunings" of various tree species and other so-called waste woods, which he then turns into bowls, ornaments, urns, and other works of art. Colin has a particular knack for combining woods as one can plainly see from the pictures of his work. He appears to take great delight in combining different colors and textural characteristics in producing his unique turned works.Colin is also and active member of Fraser Valley Woodturners Guild and the Greater Vancouver Woodturners Guild, both clubs boast of having extremely talented turners. 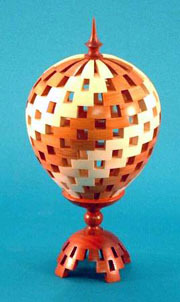 He is also a member of the American Association of Woodturners, a move that rounds out his international diversity.